Russia can supply water and electricity to the peninsula, but not immediately, which could result in problems for local residents. One of the concerns of local officials in Crimea should the peninsula decide to separate from Kiev is how to supply water and electricity to the population. Crimea receives all its utilities from Ukraine. Vladimir Konstantinov, the chairman of Crimea’s Supreme Council said that the local government is preparing for the possibility that the utilities would be disconnected. “We are working on alternative energy sources. We are ready to buy water from the Ukraine, even at inflated prices,” Konstantinov told the Interfax news agency. However, for all the politicians’ statements, the issue is a serious one. Crimea has no lakes and large rivers and water comes in through the North Crimean Canal of the Dniepr. Cutting off Crimea’s water supply would only require closing the floodgates. Vladimir Debolsky, head of the laboratory of the Institute of Water Problems at the Russian Academy of Sciences, told Business Online newspaper that the only way to ensure uninterrupted water supply to Crimea is the construction of a water pipeline on the bottom of the Kerch Strait. According to his calculations, such construction would take between two and three months and would cost between 2–3 billion rubles ($55-82 million). “Water can be taken from the Kuban River, which flows into the Azov Sea. A little north of Krasnodar, in Kuban, there is the Krasnodar Reservoir. There is more than enough water there,”Debolsky said. Another serious challenge to Crimea is the supply of electricity. At the moment, Crimea can produce only about 20 percent of its electricity needs. Alexander Pasechnik, head of Research at the National Energy Security Foundation, told Business Online that this problem could also be solved by constructing a pipelinefrom Russia on the bottom of the Kerch Strait. However, such a pipeline could only be in place by next winter, according to his estimations. Pasechnik said that another alternative for electricity supply to Crimea is the construction of gas power plants, but this would take even longer. Crimean authorities are already considering this option, butthe existing gas supply in Crimea is not enough for the construction of a new thermal power station. Currently, local thermal power stations produce only one-tenth of the required electricity for the region, and they consume at least 300 million cubic meters of gas per year. Last year, Crimea produced 1.65 billion cubic meters of gas, which is roughly equivalent to the region’s current needs. The Chernomorneftegaz company, which provides gas to Crimea and extracts gas at three offshore fields, can increase production from 1.65 billion cubic meters to 2.5–3 billion cubic meters of gas,according to the General Director of National Energy Security Fund, Konstantin Simonov. However, this gas supply increase may not be enough. Another relevant, although less serious, problem facing the peninsula is the lack of oil products. According to Oilnews, rail shipments have been disrupted due to the political instability and oil traders have also had difficulty recently chartering ships to unload in Crimean ports of Feodosia and Kerch. Crimean authorities have already announced that, should the peninsula vote to break away from Ukraine, the authorities would take over Chernomorneftegaz and local railroads, as well as any wineries owned by Ukraine located in Crimea. According to Konstantinov, oil and gas fields have already been taken under protection. 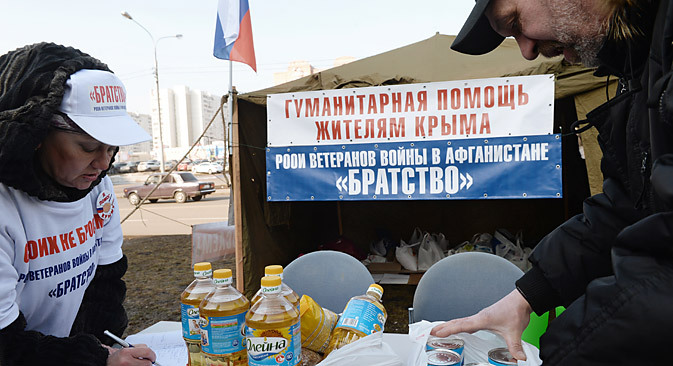 Even if Crimea does temporarily experience a shortage of water and fuel supplies, the population will still have plenty of consumer goods, although they may be more expensive, according to Mikhail Delyagin, director of the Institute of Globalization Problems. “In case of a crisis, Russia will always be able to transport food and essential goods,” said Delyagin in an interview with NoviyeIzvestiya.